"As the ordinary directness of line in town-streets, with its resultant regularity of plan would suggest eagerness to press forward without looking to the right hand or the left... we should recommend the general adoption, in the design of your roads, of gracefully-curved lines, generous spaces, and the absence of sharp corners, the idea being to suggest leisure, contemplativeness, and happy tranquility." Cordogan Clark & Associates’ design for the 41st and 43rd Street Bridges spanning Lake Shore Drive won an international design competition. Called “the state of the art in asymmetrical design”, Cordogan Clark & Associates teamed with the Chicago based firm Earthtech to provide structural and civil engineering for these bridges. This pair of unique bridges will create a powerful gateway for those approaching the City of Chicago from the south. The structure of these bridges uses double curved arch monotrusses to form large, graceful S-curves. The bridges’ leisurely curves echo those of the park’s walkways, extending the park west over Lake Shore Drive. 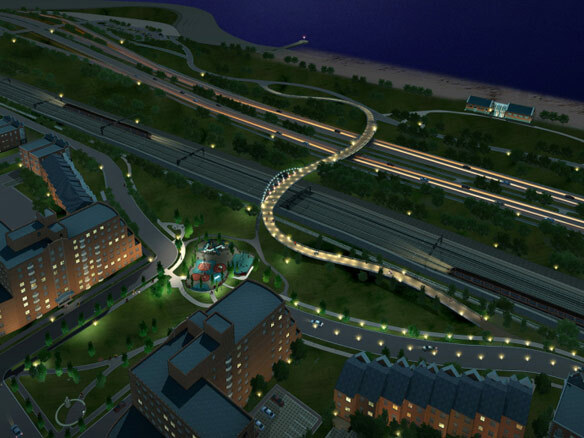 The bridges curve both horizontally and vertically; creating an urban promenade that is both graceful and dynamic. The double curvature is visually dynamic from all approaches. Its slender, minimal detailing provides excellent views to and from all areas of the bridge: There are no hidden areas. The double curvature provides greater structural dynamism incorporating the simple and unifying structure of its supporting arches. Slender and elegant arches provide the structure for a curving deck that widens at its midspans and projects outwards to create grand balconies. Continuous lighting parallel to the surface of the deck highlights its curves and provides even, low-glare illumination for the entire bridge. The bridges glide gently to rest at either side of their spans, with ramps supported on tapering rusticated prairie-stone. The structures, built and galvanized entirely in the factory, are plated in zinc to prevent corrosion. The main arches are white, with a very light gray- green cast to help blend them with the landscape. Continuous stainless-steel shrouds and railings highlight the bridge deck. Natural beige prairie stone, used at the intermediate structural support and the beneath the bridge ramps as they taper into the landscape, help the bridges blend with and extend the park environment. The lean, muscular, dynamic forms of the bridges continue Chicago’s tradition of structural expressiveness. Form, function, and structure are one. The double horizontal and vertical curvature adds inherent structural rigidity and wind resistance. The structural detailing, which uses large steel tube and plate sections, is kept simple and clean. The concrete deck is slightly elevated from the steel structure. This highlights the bridge structure and simplifies maintenance by eliminating hidden cavities and nesting places. The main sections of the bridges will be factory pre-fabricated. They will then be delivered to the site and joined together, using scaffolding at the medians. This will minimize construction downtime, both for Lake Shore Drive and the railroad. Indirect lighting adjacent to the bridge deck highlights the curves of the bridges and provides even, low-glare illumination for the entire bridge. This same light source is used to cast light onto the large steel-plate fins supporting the main arches. These highlight the structure and provide visual drama at night. Energy-efficient color-corrected luminaries are housed in the continuous stainless-steel shrouds at the base of the guardrails. These are protected from vandalism by high-impact plastic lenses, but are readily accessible for maintenance.